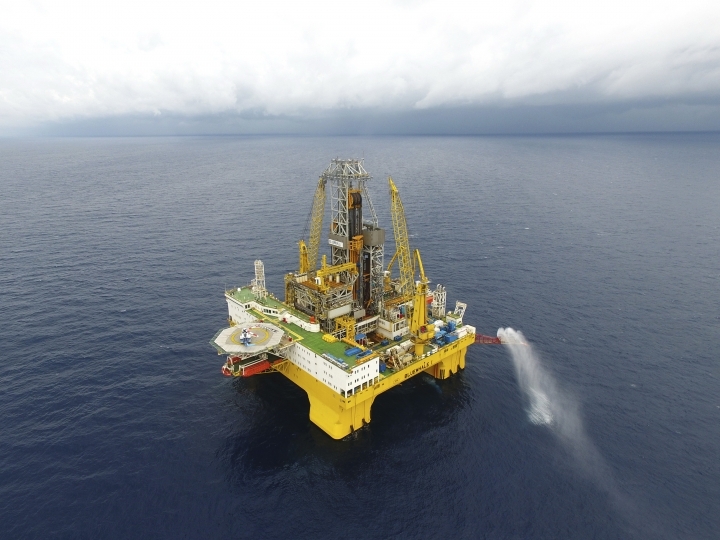 BEIJING — Commercial development of the globe's huge reserves of a frozen fossil fuel known as "combustible ice" has moved closer to reality after Japan and China successfully extracted the material from the seafloor off their coastlines. But experts said Friday that large-scale production remains many years away — and if not done properly could flood the atmosphere with climate-changing greenhouse gases. Combustible ice is a frozen mixture of water and concentrated natural gas. Technically known as methane hydrate, it can be lit on fire in its frozen state and is believed to comprise one of the world's most abundant fossil fuels. 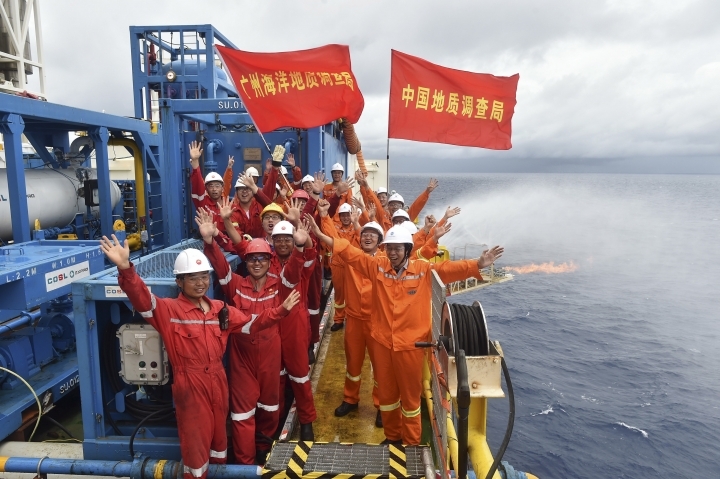 The official Chinese news agency Xinhua reported that the fuel was successfully mined by a drilling rig operating in the South China Sea on Thursday. Chinese Minister of Land and Resources Jiang Daming declared the event a breakthrough moment heralding a potential "global energy revolution." A drilling crew in Japan reported a similar successful operation two weeks earlier, on May 4 offshore the Shima Peninsula. For Japan, methane hydrate offers the chance to reduce its heavy reliance of imported fuels if it can tap into reserves off its coastline. In China, it could serve as a cleaner substitute for coal-burning power plants and steel factories that have polluted much of the country with lung-damaging smog. The South China Sea has become a focal point of regional political tensions as China has claimed huge swaths of disputed territory as its own. 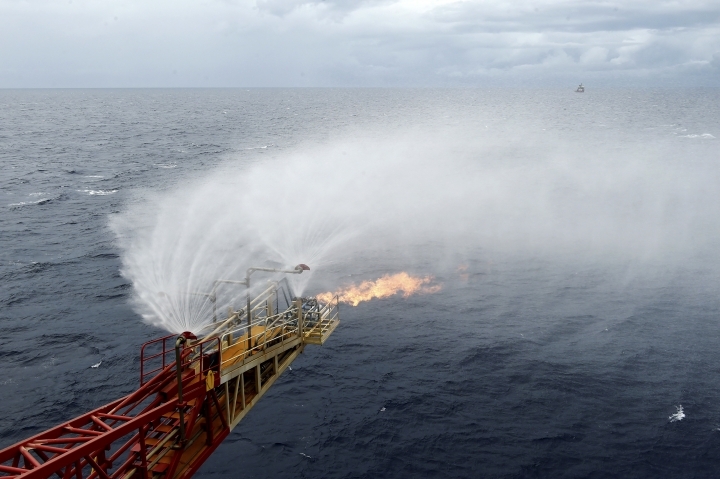 Previous sea oil exploration efforts by China met resistance, especially from Vietnam, but its methane hydrate operation was described as being outside the most hotly contested areas. Methane hydrate has been found beneath seafloors and buried inside Arctic permafrost and beneath Antarctic ice. The United States and India also have research programs pursuing technologies to capture the fuel. Estimates of worldwide reserves range from 280 trillion cubic meters (10,000 trillion cubic feet) up to 2,800 trillion cubic meters (100,000 trillion cubic feet), according to the U.S. Energy Information Administration. By comparison, total worldwide production of natural gas was 3.5 billion cubic meters (124 billion cubic feet) in 2015, the most recent year available. That means methane hydrate reserves could meet global gas demands for 80 to 800 years at current consumption rates. Yet efforts to successfully extract the fuel at a profit have eluded private and state-owned energy companies for decades. That's in part because of the high cost of extraction techniques, which can use large amounts of water or carbon dioxide to flood methane hydrate reserves so the fuel can be released and brought to the surface. Japan first extracted some of the material in 2013 but ended the effort due to sand from the seafloor clogging machinery, according to the country's Ministry of Economy Trade and Tourism. There are also environmental concerns. If methane hydrate leaks during the extraction process, it can increase greenhouse gas emissions. The fuel also could displace renewables such as solar and wind power, said David Sandalow, a former senior official with the U.S. State Department now at Columbia University's Center on Global Energy Policy. However, if it can be used without leaking, it has the potential to replace dirtier coal in the power sector. "The climate implications of producing natural gas hydrates are complicated. There are potential benefits, but substantial risks," Sandalow said. Commercial-scale production could be "transformative for northeast Asia, particularly for Japan, which imports nearly all its hydrocarbon needs," said James Taverner, a senior energy industry researcher at IHS Market, a London-based consulting firm. The consensus within the industry is that commercial development won't happen until at least 2030. Smaller scale output could happen as early as 2020, said Tim Collett, a scientist with the U.S. Geological Survey. "The path to understanding when or if gas hydrates will be commercially produced will need many similar and more extended testing efforts," Collett said. Copyright © 2015 - 2019 Technology - Malaysian Talks. All Rights Reserved.